From Cardmaker to Game Designer! DELUXE VERSION! TONS OF NEW FEATURES! Q1 -Who's the only Ignis not named after his Element? A -The Ignis of Darkness, AI. Q3 -What Card Series where used during Yu-Gi-Oh! GX' entire run? Q4 -What's the Duel Monster's Spirit with most episode appearances? Q5 -"Violent Egoism" is the Attack Name of what monster? A -Ido the Supreme Magical Force. 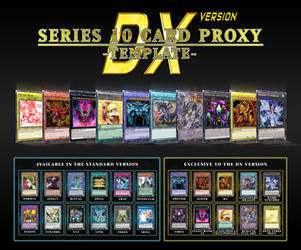 Q6 -What's the only card from ZEXAL's Legendary Deck that was "revealed"? A -Chaos End Ruler - Ruler of the Beginning and the End. Q7 -What were the only cards which showed some kind of foiling in Arc-V? A -"Darts" cards used by Sawatari Shingo. Q8 -The only monster in 5D's anime which devoured someone alive. Who am I? This journal entry is meant to be the Official HQ of the Reboot idea for Yu-Gi-Oh! TCG. Please, have in mind that much of the original content WILL be changed in order to suit a more versatible, slow-paced and strategic gameplay. But this doesn't mean that it'll change into a totally different product. No, this will always be the same Yu-Gi-Oh! we love, but without the screwed parts. This is MY interpretation of how I imagine this Reboot. You are FREE to disagree in whatever aspect you want, but if you do so, I ask you to comment about and it and explain why. This way, this very set of rules can be changed (if necessary) to something more interesting and fun to play. ALSO, note that this is a FAN PROJECT. Means that it is in no way affiliated to Konami nor is meant to be commercialized. All cards from this project will be released as Digital Proxies for Print and Play, so that you can test this format with your friends and report here (if possible, as I'd love to receive all feedback possible) your experiences. NOTE 2: This project reunites the ideas of other users, such as and . If any other idea gets implemented here, its owner will be credited. There are some things I need to state before we start with the changes so that you can have an idea of what will remain from the Original rules. ●1: This Reboot will use the EXACT SAME Yu-Gi-Oh! cards from OCG/TCG. I'm still thinking about Custom ones (Anime/Manga included), but, for now, only the real ones are 100% guaranteed, althought their effects are likely to be modified. ●2: This Reboot will use Master Rule 4 Rules. This means Link Era Format, but also modified. ●4: This Reboot will have its own Limited List. I don't think that banning cards will solve any powercreep, especially because this format is being planned exactly to avoid this, and also, I don't like the idea of not being able to use X card. Now that the background is set, let's take a look at all changes of this Reboot. ● SKILL CARDS: Like in Yu-Gi-Oh! Duel Links, Skills will be present in this format as Skill Cards. They are placed next to the Extra Monster Zone, and can be activated according to its Activation Timing. They will provide an "unexpected" factor to the gameplay, giving the cornered player a chance to turn the tide of the Duel. Like in Duel Links, each player can use only 1 Skill Card, and their usage is Optional. ● EVOLUTION CARDS: I haven't yet decided if this will be a NEW Card Type or an ABILITY. But basically, they're meant to substitute a huge load of retrained versions of well known cards. They will be now "Special Summon-only" monsters, gaining a Special clause which lets you Special Summon them by Tributing its weaker counterpart. (unless stated otherwise). These will be placed in the Main Deck. Note that, as each case is a case, not all "evolved counterparts" will be classified as Evolution Monsters. For example, "Number S39: Utopia the Lightning" is an evolved version of "Number 39: Utopia", as it only asks for "Number 39: Utopia" to be Summoned, but "Shooting Star Dragon", while being an evolved version of "Stardust Dragon", asks for much more than just "Stardust Dragon" to be Summoned. This section is a work-in-progress that needs major attention. ● SPECIAL COUNTERS: I decided to implement this mechanic in order to counter the abusive powercreep and swarms. Special Counters work like the Speed Counters from Yu-Gi-Oh! 5D's Speed Duels, you gain 1 at the start of each turn (max. 12). These are spent when you realize any kind of Special Summon. If you run out of Special Counters, you can't Special Summon. For EACH Special Summon, you spend 1 Special Counter. As for Pendulum Summons, since the monsters Summoned by this mechanic are considered as being Summoned at once, in this case, for EACH monster Summoned, you must spend 1 Special Counter. ● MULLIGAN: Extracted from CardFight! Vanguard, the "Mulligan" rule allows the Duelist who goes first to shuffle their entire hand into the Deck and draw 5 new cards. However, by doing so, his opponent will then become the goes first, drawing 1 card and gaining 1 Special Counter. That's it, the price of changing your cards it to face your opponent with a 6-cards starting hand and 1 extra Special Counter. 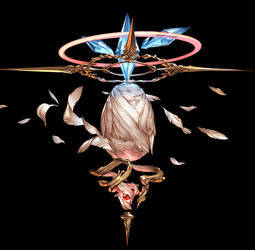 ● MAIN DECK: Main Deck will consist only of Normal, Effect, Pendulum, Spell and Trap cards. (Since Evolution Monster are yet subject of discussion, I'll not list them here.) These Card Types are the backbone of any Deck, and since Pendulum fits into both Monster and Spell categories, then there's no need to change its current mechanic or place. Usually, when a Ritual is performed, its main goal is to Summon an entity from an outer plane. The said entity doesn't need to be "pre-owned" (read needs to be in your hand) in any way to be Summoned. ● ARCHETYPES: Instead of being pointed in the Card's name, now the Archetype will appear where the SET-ID was located prior to Series 9 (i.e., below the Artwork Box, on the left.) Pendulum and Link Cards would need a rework to incorporate this change, and honestly, this is a work in progress which I haven't thought yet. ● SUMMON FROM EXTRA DECK: Link Arrows won't reign over where you can Summon from Extra Deck anymore. The Special Counters are there to "fix" this aspect. HOWEVER, The Extra Monster Zone still is the zone where the Summon from Extra Deck will be directed first. ALSO, the "1 Extra Monster Zone per player" rule will remain, being the Link Monster's Link Arrow mechanic the only way to own both zones. RITUAL: Ritual Spell Card (in your hand or field) + Ritual Monster Card (in your hand) + At least 1 Tribute (in your hand or field). FUSION: Fusion Spell Card (in your hand or field) + At least 2 Materials (in your hand or field). SYNCHRO: At least 1 Tuner + at least 1 non-tuner (both on the field). XYZ: At least 2 Materials of same Level (both on the field). LINK: At least 1 Material (on the field). RITUAL: Generic Ritual Spell Card. FUSION: Contact Fusion and Mask Change. As we can see, Xyz Summon and Link Summon are the more powerful/generic ones, being extremely easy to perform and having place in ANY DECK, being Link Summon the only one able to be conducted with only 1 card. However, the monster summoned by this method is usually weak, making the said mechanic for this situation fair. My idea is to make the mechanics more standart for each of them, having at least 1 major element reigning over the said Summon. For Fusion Summon, they'd still rely on the "Fusion" Spell Card, as you can fuse from the field or hand, leaving a 3-card requeriment. Maybe a good way to change the requeriments to 2 is to change the mechanic to work as Contact Fusion as whole. This leads to 2 changes: The first is to perform the Contact Fusion, both materials need to be on the field, while the second is ONLY with the Fusion Spell is that you will be able to Fuse from Hand or other places. For Synchro Summon, it would still rely on the "Level Matching" mechanic, leaving a minium of 2 cards, being the Tuner monster the decisive factor over this. For Xyz Summon, it would still rely on the "Same Level" mechanic, leaving a minimum of 2 cards. For Link Summon, it would still rely on the "Monster Quantity" mechanic, leaving a minimum of 1 card. ● EXTRA MONSTER ZONE FIELD RULE: I thought about the Monster Card Type in the Extra Monster Zone dictating which kind of Summon your oppoent can have in their field. Like, if you controlled a Synchro Monster in your Extra Monster Zone, then your opponent can only Summon (from the Extra Deck) Synchro Monsters to their Main Monster Zones. Oct 28, 2015 I'M BACK!!! Oct 19, 2012 News about my Cards! Sep 1, 2012 Full-Art Card template made -AGAIN-!!! © of Konami and Kazuki Takahashi. Be sure to make a good effect for it, 'cuz it was kinda troublesome to reach this resuçlt. -Credit isn't necessary, but very appreciated. -Don't reupload or redistribute this. Superstars archetype is a collab between my beloved BatMed and I, to represent our Team, DarkSide of Conspirations. There's one for each member, and some bits of lore hidden "within" each art. It was quite a ride to make this godamn circle thingy, but it ended out pretty great IMO. Cards are in his profile, so make sure to check them all. grezar has started a donation pool! 1000+ Deviations, 3.700 comments and 370.000+ Views. So, please, if you like my work and want to support my projects, please, donate. Apologies if this has been asked or if it's in the works, but do you plan on doing a template (or know of any) for the back/rear of Skill Cards? It's not in the plans, as I find it quite... useless. I mean, you'll be practically telling your opp what skill you'll be using. BUT, if the demand for it increases, then I might give it a try. You're welcome and Happy New Year.